Theatre Trivia Tweet: Sholess Joe's Home | All Tickets Inc.
Gwen Verdon played Lola in the Broadway production of Damn Yankees. 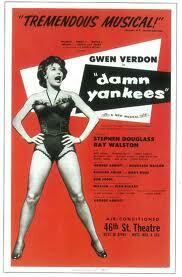 In the musical Damn Yankees where does Shoeless Joe say he’s from? Joe, who is an amazing baseball player with no history due to the fact that he’s an old guy in a young man’s body who has made a pact with the devil, claims to be from Hannibal, Missouri or as the say in the show- Hannibal, MO.